Microencapsulated Enrofloxacin. Broad spectrum antibiotic. 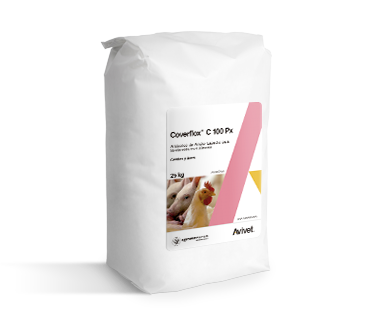 Coverflox® C100 Px is an antibiotic mixture based on microencapsulated granules containing enrofloxacin. The microencapsulation process grants a series of exceptional properties: greater stability to the molecule, resistance to pelleting, masking the smell and taste, liberation of the drug in the right place, improves the stability of the drug and maintains the pharmacological activity at Mixing and premixing time, reducing the risks inherent to the generation of dust. Poultry: 10 mg / Kg, equivalent to, 0.5 Kg - 1 Kg of the product per 1000 kg of food for 3 - 5 days. Swine: 2.5 - 10 mg / Kg, equivalent 0.5 Kg - 2 Kg of the product per 1000 Kg of food for 3 - 7 days.